I’m very glad to be hosting Shobhan on the first day of her virtual blog tour with Promo 101 Virtual Tours. She has a writing style that I think you will like and she isn’t afraid to tackle the hot button topics. Read on to learn more about Shobhan Bantwal and The Forbidden Daughter. A deep interest in women’s issues combined with the love of fiction inspired me to write a book about gender-based abortions in India. I had an opportunity to bring awareness to the issue by weaving it into a story of romance, intrigue and drama. It allows me to voice my opinion on a social issue in a highly creative way. If I had written a non-fiction book on the subject, it would have been boring for me to write and very few people would have read it. A novel is a way to reach a broader audience. Many Americans, although aware of the general societal patterns of other countries, very rarely know about the more subtle social issues, both good as well as bad. THE FORBIDDEN DAUGHTER will provide them a rare glimpse into a culture that remains very private about certain negative elements. Daily newspaper and TV stories are a great source of creativity. For some odd reason, driving on the highway seems to trigger it for me, but sitting in front of a computer makes my creativity plunge to zero. My biggest stumbling block is my lack of computer savvy, which hinders my ability to use the Internet to optimum capability. Amazon optimization, blogging, chat room discussions, etc. are not something I can utilize for promoting my book mainly because of my inability to use technology. I believe people become authors because of their deep love for expressing their ideas and opinions to others. It is a way of communicating, by being a storyteller and narrator. For myself, my motivation was to acquire a hobby that would keep my mind alert and provide an outlet for my active imagination and creativity. When I took up creative writing, I had not really dreamed of being a published author, but as I wrote more and more, my ambitions expanded. I honestly wish I could think of something unusual to do, “outside the box” as they say, but so far I have done only the most traditional things. I like a small town atmosphere, like the kind I grew up in, so I created a fictitious small town that is very similar to the town I was raised in. It made the visualization much easier, without having to struggle to build a new one. The descriptions came easily and the culture of course is latent to me, so that was not an issue. Both my hero and heroine are people of strong convictions and generous natures, and they act on them without regard for tradition or personal gain. I find that very inspiring. Their strength and ability to fight and survive, and even win in the face of adversity is what makes them memorable. The main motivator for my heroine is the need to protect her children at any cost. The hero is motivated by his inherent desire to be the ideal doctor – help people in trouble. The obstetrician who first suggests an abortion and later resorts to more serious crime is the one who first introduces friction in THE FORBIDDEN DAUGHTER. There are secondary villains who augment the main villain’s deeds with their in their own twisted way. They all serve to add tons of friction that lends plenty of action and drama to my story. For the most up to date tour information, visit www.virtualblogtour.blogspot.com. There are two posts – one is a review and the other is an interview. Abundant Solutions Radio Show – http://www.blogtalkradio.com/asemotivation – Call-in Number: (718) 508-9600. The show is live from 9 – 10 pm EST. You can also download the recording to listen after the show. In the 21st century, it’s no longer optional to have a blog. All authors need to have a blog to promote their books. To get started, you can easily set up a blog on www.blogger.com or www.wordpress.com, each of these services offer free blogs and you follow the directions on their sites to start blogging in minutes. Over time you can learn ways to fine tune your blog and to customize the layout or you can hire someone to set up a blog and to teach you the best ways to use that blog to promote. Originally a blog was simply a way to communicate with friends. However, blogs are a great way for authors to build a brand and establish a promotional platform for their books. You can use a blog to help potential readers get to know the author behind the book and to learn more about the books you write. Think of it as a cyber sales person who is representing you 24 hours a day, 7 days a week. What is your cyber salesman saying about you and your books? A blog can include information about your writing, how you write, how you develop story ideas and why you’re qualified to write your books. Non fiction authors can use their blog to build their credibility with potential readers. Take the opportunity to show people that you have something and why you have the background and knowledge to help them. Fiction authors can share insider details about their books, the characters, the setting and many other parts of their books. You can also share writing and promotional tips with others. Just starting a blog is not enough. Once you have a blog and once you start blogging on a regular basis (at least 2-3 short or long blog posts per week), you need to list your blog in blog directories. Two or the many directories include: www.blogcatalog.com and www.Technorati.com . Your blog address should be listed on your author business cards, linked to your website and listed in your email signature block. These are a bare minimum of the places where you should list your blog address. It is also very good to register your blog with www.feedblitz.com or www.feedburner.com and place a subscription block so that interested readers can subscribe to your blog. This means that they will be notified about each of your future blog posts. It’s a great way to stay in touch with interested readers. This is only the beginning of your blogging journey, but it will get you started and will help you to start getting the word out to your potential readers. If you like the idea of having a blog, but you want to speak to someone about setting up a blog and teaching you how to use and promote it, feel free to contact me for details about my blog consulting service. Are you a sales person or a business person who needs to generate more sales? Then you need to learn more about Winton Churchill’s book – Email Marketing for Complex Sales Cycles. The title may sound complicated – but Winton breaks it down and makes the process, the do’s and don’ts very simple to understand. Email is not a bad thing and handled properly, it can be a very effective way to promote your business. Winton Churchill is a man who can help you learn to do it right. Winton Churchill will be featured in the Self Growth Self Improvement newsletter this week – visit www.selfgrowth.com to subscribe to the newsletter. The Ethnic Presidency: How Race Decides the Race to the White House – Will Race and Ethnicity Decide the Presidency? Any way you look at it, this is a historic political season. Whether the next president is a Democrat or a Republican, there will be a “first” in the new administration. The first black president or the first woman vice president will be elected. The media and the internet are buzzing with the possibilities. Race and politics is an interesting and sometimes explosive combination. 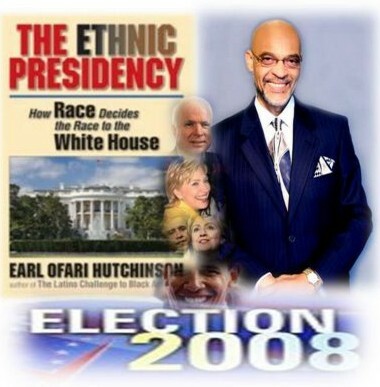 This topic is the focus of Earl Ofari Hutchinson’s book The Ethnic Presidency: How Race Decides the Race to the White House. Throughout this election year, we have all seen the news reports, the specials, the debates and much more that addresses the questions and curiosity about race and politics. More specifically, what it would mean to have an African American president in the white house. Race isn’t a new issue in politics and The Ethnic Presidency delves into a vast array of details from the past three decades to demonstrate the difference race and ethnicity makes in any election. Race is a much bigger factor in the 2008 election than it has been in past elections. For an inside view at the history of race in politics, take a deeper look into The Ethnic Presidency. This book is a must have for political junkies who follow each election, but it is also a great primer for the millions of first time voters who would like to understand more about the people and the elements of this election year and elections in the past. Get a real look at the way each political party used race and ethnicity to further their agenda through the years. · Will America accept a black president? Can Obama be that president? · Will the GOP use the same Southern Strategy that repeatedly won the White House? · Did blacks and Latinos elect Bush? · Have the Democrats taken the black and Latino vote for granted? For much more information and to order your own copy, visit The Ethnic Presidency on Amazon – http://www.amazon.com/exec/obidos/ASIN/1881032256/. Earl Ofari Hutchinson is an author, syndicated columnist, political analyst and commentator. He is a frequent guest on Hannity and Colmes, The O’Reilly Factor, The Big Story, EXTRA, and numerous CNN News and Talk Shows. He is associate editor of New America Media. His op-ed columns appear in the Baltimore Sun, Huffington Post, L.A. Times, Los Angeles Daily News, Washington Post, Chicago Tribune, Newsday, the Philadelphia Inquirer, San Francisco Chronicle, and the Christian Science Monitor, and other major newspapers. He is the author of ten books.